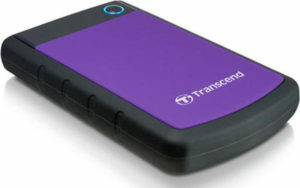 One of the most well known external hard drives in use today is the Transcend Storejet series of hard drives. In case you didn’t know, underneath the cover of all the different external hard drives available are standard hard drives made by Seagate, Western Digital or Toshiba. So really, all you’re buying is a pretty case and some packaging, but anyway there you go… So in this post we look at two instances of problems with Transcend Storejet hard drives requiring data / file recovery. Data recovery from this type of hard drive will usually cost in the region of £500. I own a Transcend Storejet 25M3 1TB external hard drive. It is still functional but due to an accident the connection port for the device is damaged and the cable doesn’t lock into place (I have tried other cables). This results in the hard drive disconnecting with the slightest nudge or movement and/or a periodic freeze in data transfer of approximately +30 seconds every 10-20 mins. Can you fix this? If so How much would it cost me? – I live in Derby and frequently travel to Sheffield. I am a video editor. Yesterday I was working on a project and the external HDD (a Storejet, made by Transcend) started to act weird when I was exporting 2 clips using 2 different softwares (on mac by the way). Afterwards I restated the laptop and the hdd was a bit slower to load all the files. I opened the hdd folder and I could see all my projects, in some of them I could see the content (jpg, mov) and in others it kept loading without showing any file. Also it takes ages to eject it. hope this help. Photos lost after wipe and reinstall of windows 7. Everything else was backed up but the photos were forgotten. Recuva failed to find the files. 750gb mech drive (not ssd). I work in Sheffield and sometimes travel to Glasgow. I dropped my external hard drive from like 40cm height on a hard floor. My computer can’t recognise it anymore now. The hard drive makes noises when plugged in to the computer. At a certain point and for no apparent reason the Storejet drive ceased to be read or acknowledged by my mac or any other mac, but still turns on when plugged in. The presence of the drive could still be recognised by PCs but of course they cannot open or access the contents. It has been connected to a computer several times since this happened. RAID data recovery Information and advice a retrieving data from failed RAID arrays and servers.